Two bowls of melted chocolate, a bag of pretzel rods, and some Christmas sprinkles made for a great time at our house today - and a pretty fantastic looking bunch of cookies. 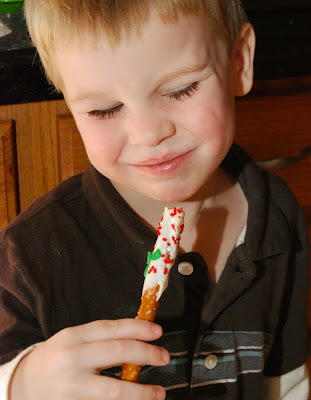 The boys had a BLAST dipping the pretzels into the "choc-wit" and picking out which kind of sprinkles they wanted to use on each one. Our lesson: The shepherds (whose staffs resemble our pretzels) were so excited to tell everyone about the new baby Jesus. We want to tell everyone about Jesus, too. Melt chocolate chips in microwave in two separate bowls at 70% power for 1 minute. Remove and stir. Continue microwaving in 20 second intervals and stirring until chocolate is melted and smooth. 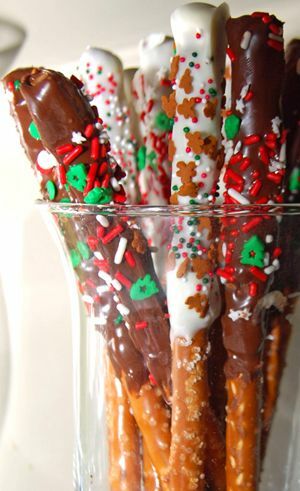 Dip pretzel rods into melted chocolate. 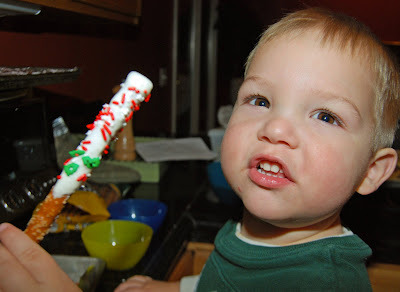 Decorate with desired sprinkles. 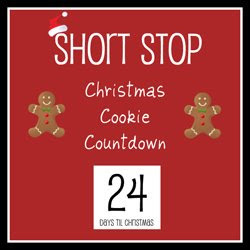 Place on foil covered cookie sheets until chocolate has hardened. Serve in small glass hurricane. i made this one last year for a christmas party we had. the pure simplicity of it was great for this low maintenance hostess! I just sent you a little something in the mail today. Hope you enjoy it. Merry Christmas!